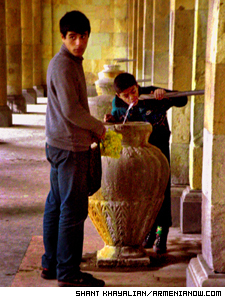 Water cuts a deep path through Jermuk, and is the town's main attraction. One word can be used to describe Jermuk: water. Jermuk's healing mineral water is used for treating diseases; drinking water; bathing streams; and streams flowing from the mountains break the silence of the streets of this lonely spring town with their babble. Russian scientist Demiokhin said Jermuk's mineral waters flow "like the last breath of a dying volcano". Armenia's famous mineral water flows from five different temperatures and sources in Jermuk's Hellenic-style tap hall in the town of the same name, 185 kilometers southeast of Yerevan. The Arpa Gorge divides the highland into two parts, where the river flows through yellow-orange 80-meter-high rocks overgrown with moss flowing on the volcanic highlands 2,080 meters above sea level. ?he name of the town originated from the warmth of approximately 60 mineral sources. Ghevond Alishan, a 19th century historian, writes, "Jermuk is an old village and from antique times it is famous for its water with iron taste and people used to have baths with that water for being treated." Built in 1951, Jermuk was the only Armenian All-Union health resort, treating people throughout the former Soviet Union. Ninety percent of its patients were from outside Armenia. Five big health resorts, including a polyclinic and health resort, functioned during Soviet times 12 months a year. Every day approximately 2,000 patients visited. A daily 20-minute flight from Yerevan brought people who needed treatment from throughout the Soviet Union. After the collapse of the USSR, Jermuk faded into an ordinary recreational area, and its airport was turned into farmland. "One must have had a pull to get a plane ticket. It was impossible to get one in summer, and they used to throng in private apartments. The work schedule was very intense in the health resorts. They were turning out nurses from their rooms and placing beds there," municipality worker Zemfira Sargsyan recalls. Now the town has two lives. In winter months when the health resorts and rest houses are not functioning, most cafés and shops are closed. Jermuk comes alive in summer. The first tavern opened since winter is a tea-house with wooden ornaments made in the style of Soviet resort cities. It opened in mid-May. "We opened the tea-house as we are preparing for the season," says director of the tea-house. "There are only two to three people working here. During the season there will be more people working here. There will be those who make khorovats and kabab, and the menu will be enriched with many different dishes." It is a town with a heritage of water and a water-producing industry. Four of five health resorts and all of the rest houses were privatized, and thanks to investments they will function year-round. The boiler house for providing warmth in winter time is being constructed in the Jermuk health resort that was privatized last year. The only thing remaining in Jermuk from Soviet times is the name "Lecho" used among people (medical institutions for high-ranking officials once were called Lechkomisia). People of different position in society are treated in a 700-room building. The price for one day, including treatment and three meals, is 12,000 drams (about $21). Last year 700 people took 18-day treatments in the health resort. The majority of them got health resort vouchers from the Ministry of Social Affairs. Visitors also came from the USA, France and Russia for treatment. This year the resort expects the same number of visitors. Demirchyan's Cottage, once used by First Secretaries of the Soviet Union, is reserved for high-ranking dignitaries such as the Prime Minister of Armenia. 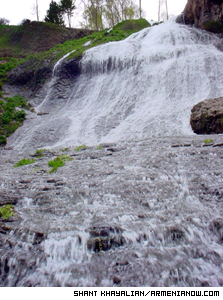 People come to Jermuk health resort and others for the healing qualities of its waters. "Mineral water conducts microcirculation of the vessels, namely, their wash-out, strengthening of vascular walls, as well as wash-out of the liver. All of that is very helpful for diabetics. Besides, diabetics very often go blind. The eye is the only open neural organ. Wash-out with the mineral water can prevent blindness. Thirty percent of our patients are diabetics. Mineral water activates the metabolism, which is very important for diabetics," says doctor and deputy director of the Jermuk health resort, Vardan Sargsyan. "First of all, mineral water cures diseases of the alimentary tract, then diseases of liver, gall bladder and the nervous system as well." Mineral water has a basic composition that cures patients with acidity, including different methods of hydrotherapy such as drinking the water; hot baths of different temperatures; gynecological douche; enemas; water jet massages of the body, gums and intestines; and other therapies. The tap hall's first spring has a temperature of 30 degrees (Celsius). Each subsequent water source grows hotter, and the fifth source water's reaches 55 degrees. During cold weather, the springs' warmth remains on your face for a long time after you rinse and then put your face into the cool air. One can hardly take a sip from the hottest source without burning the lips. It seems that your teeth would crack from the coolness of daily use drinking water coming from small fountain next to those hot sources. In Jermuk one can drink water of +640, then go 200 meters away and find another place where the water temperature is +50 - +90. "Jermuk is not only for sick people. Healthy people can also take prophylactic treatments in the health resort, especially, those, who wish to lose weight, as mineral water dissolves fats and increases frequency of urination. "There are no healthy people, simply the period of disease is hidden long," says Vardan Sargsyan. "We have different types of treatments for anyone, of course. First we examine them, and only after that we prescribe proper hydrotherapy. Jermuk is contraindicative only for people with heart trouble. Both hot water and lack of oxygen are harmful for them. But there are patients who are treated with the help of the lack of oxygen." 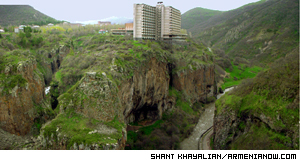 Several hotels were built in Jermuk during the last few years. It is cheaper to rent an apartment (one day costs $10 in an apartment for 2-4 people, compared $10 per person in a hotel). Unlike Yerevan, there is permanent water in Jermuk, and the entire town is gasified, ensuring hot water in all hotels and a majority of apartments. Those who stay in hotels and apartments can also take hydrotherapy courses in health resorts. "Every year the number of tourists increases," says taxi driver Kamo. "It affects my work as well. Last year the number of my clients increased and my income increased, comparing with four years ago." Thousands journey to Jermuk to bathe in its medicinal waters. Production of Jermuk mineral water is the town's main industry. During Soviet times, the only factory's production was 57 million bottles of mineral water each month, with 10 percent of production kept in Armenia. Today seven factories produce Jermuk mineral water. The principal factory, also the former Soviet factory, produces two million bottles every month. "All factories combined are now close to production during Soviet times, but now the main market of Jermuk is Armenia. Some quantities we export to Russia and USA," says Atom Avetisyan, head of the Technical and Industrial Department of the Principal Factory, who was a director of the factory during Soviet times. In several days the prattle of the streams will be drowned by the noise of cars and the town's first visitors, who arrive at the resorts in the beginning of summer and enliven memories of the noisy health resort of Soviet times.